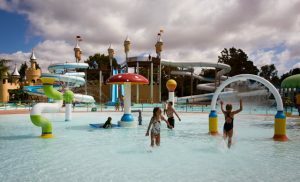 Splash Planet is fairly well known by summer visitors to the Hawkes’ Bay region and is generally a firm favourite with locals. It’s most talked about for the slides and water features but there’s also a whole section of the park dedicated to ‘dry rides’ which is great for younger kids who might be restricted from going on the water rides. ‘Dry Rides’ include a train that does a loop around the grounds, Tiny Town which is an enclosed play area especially for those aged 7 years and under, mini golf, beach volley ball and a flying fox. In addition, there are Jungle Jeeps which must be driven by someone 120cm+ (but a smaller child can be a passenger) and Formula Fun Karts for those 130cm+ in height. If it’s water fun that you’ve come for, there are slides galore! Although there aren’t any height restrictions on these, children must be able to swim and they are mostly one person riding at a time (so an adult and child can’t ride down together – the exception is the Double Dipper, where an adult MUST accompany a child). Exceptions to this are the following; Pirate Fortress (playground equipment for climbing and sliding, set within a pool of roughly 1m of water), Pirate Run (an inflatable which operates in good weather only) Never Ending River (a lazy river) and indoor heated pool which all require kids under 8 need to be actively supervised by someone 16 years or over. Another restriction to be aware of with wet rides are the Bumper Boats which need to be driven by someone 110cm+ and all kids need to be able to sit up and hold on to the bar. TOP TIP 1: Outdoor pools aren’t heated. The indoor pools are heated to about 28 degrees. Smaller kids often get cold, if you have one, bring a wetsuit and/or a dry towel and warm outer layer for cold children to warm up quickly. TOP TIP 2: Leave your valuables at home! Lockers cost $2 every time you need access to them. TOP TIP 3: You can take your own food in (so long as it isn’t commercially bought e.g. KFC). Take plenty of water to keep everyone rehydrated. Shaded spots around the pools tend to be taken early in the day, so think about taking a sun umbrella or shade tent especially for younger family members. Alternatively, look to go further into the park where they’ll be fewer people and big trees to sit under! TOP TIP 4: If you don’t plan to go down the slides, get a spectators pass which is much cheaper and you can still accompany younger kids in the toddlers’ pool and take them on the train. TOP TIP 5: It can get very very busy especially on hot days, including long queues forming before it opens. While this can add to the atmosphere, if you don’t get there early, think about leaving it until the Siesta prices start at 3pm – fewer queues inside and outside as people start to leave and cheaper entry price but still 2.5 hours to enjoy the facilities. Check here for Siesta Prices. Address: 1001 Grove Road, Hastings. Parking available onsite. Open: during the season, open daily, 10am – 5.30pm. From after Waiting Day (so early February – exact date changes each season) reduced opening 10am – 5.30pm Saturday and Sunday only until it closes early April. Check the limited opening days/closure on the website. Price: for a full list of current prices, look at the website here. Passes give you access to either everything (‘Super pass’ Adults $29, Kids 4 – 13 years $19) or just the wet rides + train (‘Swim Pass’ Adults $19, Kids 4-13 years $13). It’s also worth noting that a spectators pass gives access to the toddler pools and train. Children 3 years and under are free. If you don’t want to go for the whole day, consider a siesta pass which gives entrance to everything from 3pm.